Brith of a Nation. 23 May 1568, the battle of Heiligerle, is commonly considerd to be the start of the war of independence and the initial step towards the Dutch golden age, and it was a victory for the rebel army against the rule of the Roman Catholic King Philip II of Spain. This led to the formation of the independent Dutch Republic. The first leader was William of Orange, followed by several of his descendants and relations. The purpose of this site is to introduce non Dutch speakers to the 17'th century world of The Republic of Seven United Provinces. There are many sites about this so called Dutch golden age, but hardly any in English. This is private initiative, meaning it always will be under construction. So, if you don't find your answers right now, please come back later. We do appreciate you help, whether it is through interesting publications, financial support or any feedback and we are happy to answer your questions. Please feel free to contact us. For now, we wish you a great time in our golden age from the liberation from the Spanish, through epic conquests, breakthroughs in art & science, the establishment of true global trade and heroic warfare with all its negative sides of human tragedies. Trade and expansion. In 1602 the Dutch United India Company (VOC or Vereenigde Oostindische Compagnie) was founded to commercialise all trading activities in India. 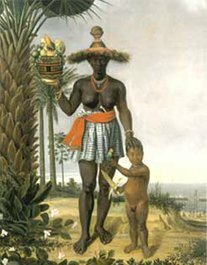 In 1621 the Chartered West India Company (WIC or Westindische Compagnie) was founded with the same purpose for the Americas. Both companies initiated a global trade unequalled for that period. Decline. 1672 is commonly known as 'the year of disaster' (het rampjaar). The Republic was simultaneously attacked by England, France, and the prince-electors of Münster and of Cologne and quicky occupied major parts of the country. 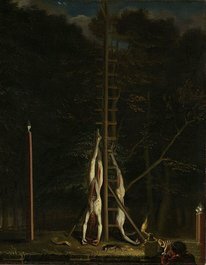 A desparate mob lynched the brothers De Witt and the future William III came into power. 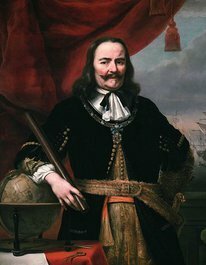 The navy under Michiel Adriaenszoon De Ruyter rescued The Republic, but the economy suffered a severe crisis and never fully recovered - though the Dutch Golden Age is usually said to have continued until 1695 when it was invaded by the French. The sea is Dutch. In the early days of the 80 years war, resistence against Spain was ignited by sea (watergeuzen). Throughout the war, the Dutch enonomy developed over sea, taking by forcer the Portuguese and Spanish possesions in the East and West Indies, whilst trading to to Eastern Europe and fishing for herring and whaling boomed as never before. 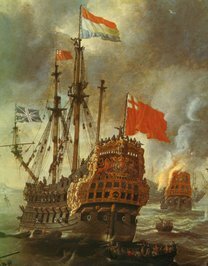 In order to defend its trade and possesions, the Dutch built an enormous naval war fleet and gained numerous victories against the Spanish, Portuguese, English and Swedish. Last but not least due to its capable and equallt brave Commanders..
Art & science. 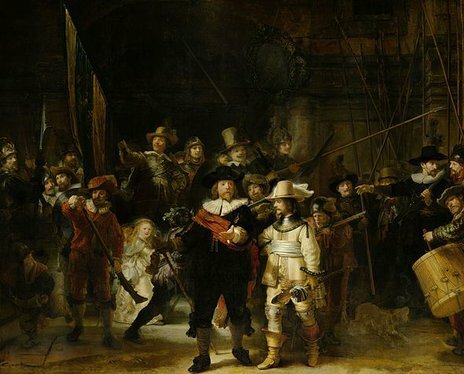 Who doesn't know The Night Watch (Dutch: De Nachtwacht, 1642)? The famous painting of Rembrandt van Rijn. One of the many expressions of art during the golden age. But many scientific breakthrough were possible in this period because of the climat of intellectual tolerance. Descartes, Spinoza, Leeghwater, Comenius, Stevin, Swammerdam, Sweelinck, Hooft, De Groot, Boerhaave, Cats, Barlaeus, Huygens (astronomy), Leeuwenhoek (micorbiology) and Locke. Just a few names make my point. People of the Republic. The Dutch society in the golden age was extremely complex. In earlier centuries, royalty had sold their priviledges to the cities. The real leaders of The Republic were the 'Regenten' (leaders of the Dutch cities and often rich merchants) who were selected in the national government ('Staten Generaal') with the 'Raadspensioenaris' as chairman.So, trade was the real source of power. 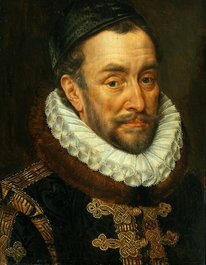 The members of the House of Orange were responsible for the execution of politics of the 'Staten Generaal' and militair leader with certain rights to appoint of city officials. All these levels often had conflicting interests and centers of power shifted frequently. The (devided) Protestant movement controlled the social order and their leaders were important too. 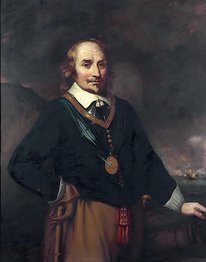 After aristocrats and patricians came the affluent middle class of which many made a name for themselves as explorer (Abel Tasman, Cornelis de Houtman, Willem Barentsz), Governour of the colonies (Maurits van Nassau, Jan Pieterszoon Coen, Anthony van Diemen, Cornelis Aerssen van Sommelsdijck, Ryckloff van Goens) and war, such as Admirals De Ruyter and Tromp (shown here on the painting by Jan Lievensz), Witte de With, Johan van Galen, De Banckerts, De Evertsen, Cornelis Jol and Piet Heyn.